The openly Christian, vaguely Mormon-critical WND uses this headline for a link to a Deseret News article on how evolution is taught in Utah schools: "Utah's non-war over origins." The WND subhead reads: "Darwin's theory taught – but probably not believed." The WND headline is found in a group of stories tracking the war between scientists and Creationists -- thereby suggesting that "those darned Mormons" aren't toeing the party line in the anti-evolution fight. Suppose, just suppose, that the evolutionists are right. Suppose the most rabid evolutionists are right. Suppose life erupted in the oozy slime of prehistoric sea glurge, which then spat forth trypanosomes and tyrannosaurs, marigolds and monkeys. And suppose those clever little marsupials somehow spawned Fred and Wilma, Daryl Hannah, and me and you. 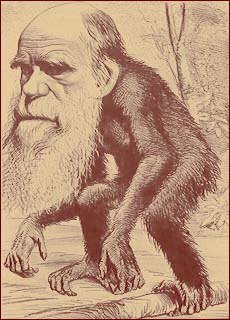 If this Darwinario turns out to be True©, does it disprove Creationism? Mormonism parts with Mainstream Christianity™ on several doctrinal points, in particular, in its beliefs about an antemortal spiritual existence. Traducianism -- a view held by, amongst others, Lutherans. It argues that both the human soul and the human body are propogated by the parents. In other words, the act of conception creates every element of humanity. Creationism -- a view held by the larger body of Christianity, which argues that the soul is created by God immediately upon conception. The Saints, on the other hand, hold to a belief that most nearly matches the doctrine of Infusionism (also called proeexistiani), which posits that we existed as intelligences, and then as teachable spirits, and individual personalities, long before we came to earth, and that our spirits are infused into our bodies at some point between conception and birth. Uniquely, the Saints believe that the soul is the permanent (and longed-for) union of the body and the spirit -- a state that exists only amongst resurrected beings. What has this to do with evolution and creationism? Just this: Latter-day Saints, alone amongst all of Christianity, can embrace science and theology. Only Mormonism can worship a God that uses evolutionary means to create bodies for mankind, and then -- at a time of His choosing -- infuse those bodies with His spiritual offspring. The beauty of holding this position: Joseph Smith understood and taught the principle of antemortality well before Darwin published The Voyage of the Beagle, the seminal work of evolutionary theory. Mormonism alone can confidently assert that we are the literal offspring of God, and that the mechanism by which our bodies came into being is merely interesting, and not at all relevent to the fundamental truth of the gospel. So go ahead, my fellow Saints. Embrace evolutionary theory. Teach it. Believe it, if you like. For its great irony is that it demonstrates the truth of Mormonism.